Best Puppy Chow Recipe was originally posted in December 2012. Puppy Chow is a chocolate-y treat that’s sure to please! This easy puppy chow recipe includes an original version AND a mint chocolate puppy chow version. 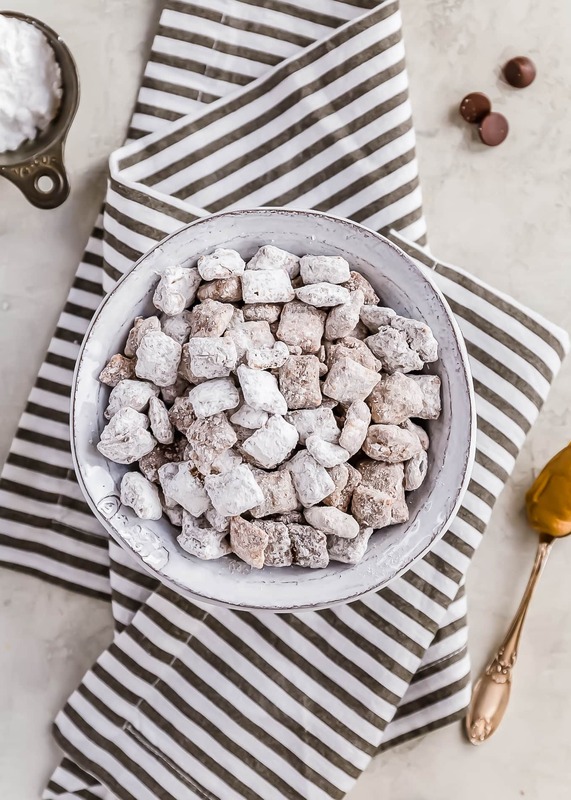 Find out how to make puppy chow for a simple yet delicious holiday treat! After making mom’s famous Chex Party Mix, I started thinking about my other favorite snack mix: PUPPY CHOW. 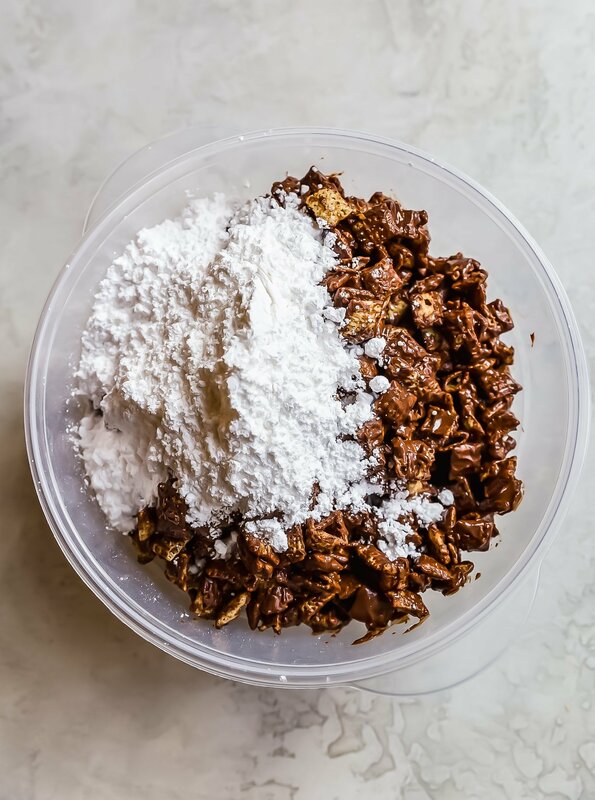 If you’ve never had this delicious little snack before (or if you’ve never even heard of it), then you’re in for a real treat today because this is the BEST puppy chow recipe in existence. I have always found my mom’s recipe for puppy chow to be different (and better…let’s be honest) than all the others I’ve tried. I think it’s the Ghirardelli milk chocolate chips and the extra powdered sugar! 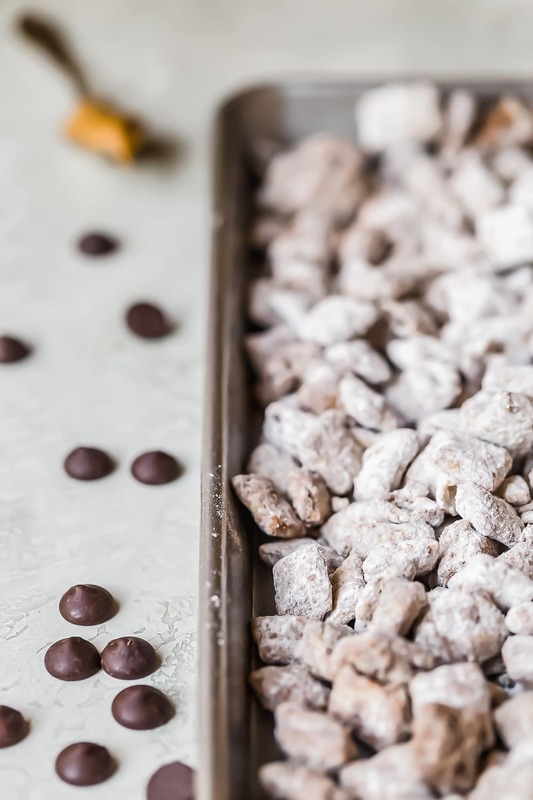 And to make things even better, I’m giving you two versions: I’ll show you how to make puppy chow AND how to add an extra fun twist with MINT puppy chow. They’re both so good! I can’t decide between original and mint, so I usually just make both! This stuff is so good. It’s the perfect little snack to serve at parties, especially holiday parties! Something about that kick of mint makes it feel so Christmasy. And a batch of this stuff would make a fun Christmas gift too! This puppy chow recipe is easy and delicious. Make the original flavor or add in some mint! Either way, it’s perfect fort he holidays! 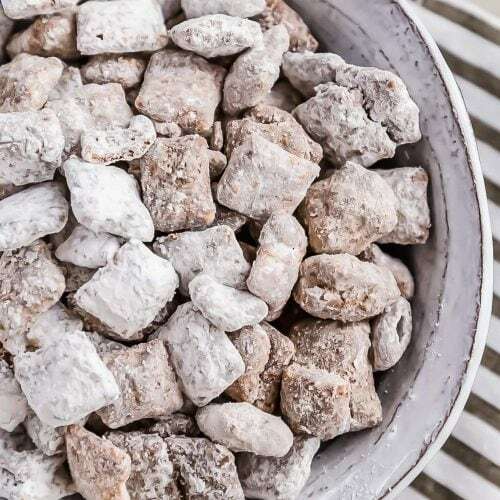 There might be some of you out there who have never been blessed with the gift of puppy chow…if that’s you, I’m really sorry you’ve been missing out on this for so many years. But I’m here today to change your life with the BEST puppy chow recipe. A lot of people are confused by the name of this stuff and assume it’s a snack for dogs. Wrong! 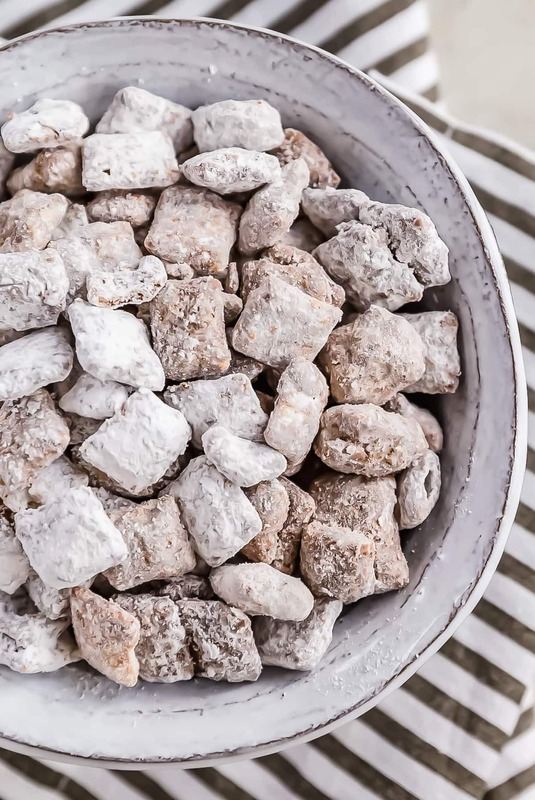 Puppy Chow is a sweet, chocolatey treat for people, and it’s pretty addicting. 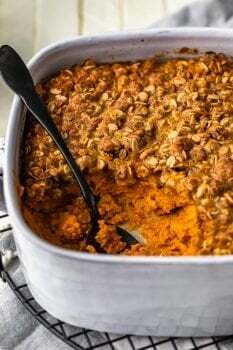 I guess the name comes from the fact that it resembles puppy food at a glance, but take a look at these photos and tell me it doesn’t look like the most delicious thing ever. 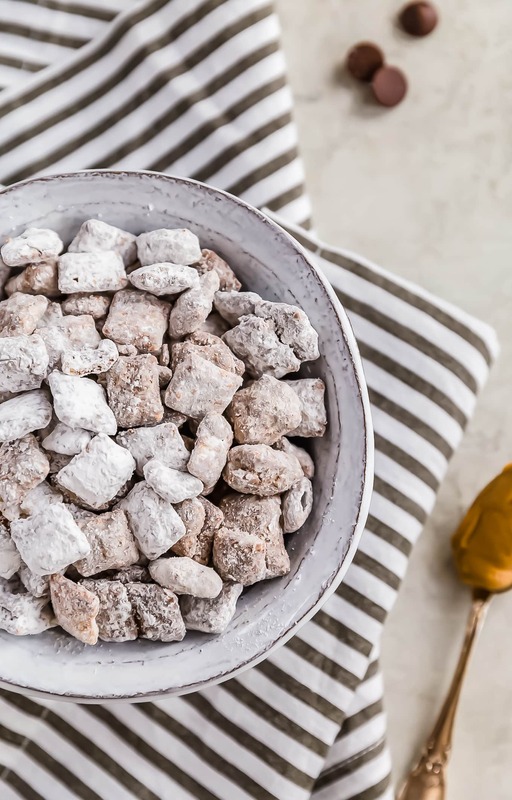 This classic snack is also known as Muddy Buddies, Monkey Munch, or Reindeer Chow. So what’s in puppy chow anyways? It starts with a classic corn/rice cereal, usually Crispix or Chex. This recipe make puppy chow with Crispix. It’s coated in chocolate, peanut butter, butter, and powdered sugar, and then shaken up into true perfection! It’s a pretty basic ingredients list, which means you might already have everything you need in the pantry. That’s one of my favorite things about it really; the fact that you can open your pantry and pull this snack together without any planning! Like I said before, you’re getting two flavors in one with this easy puppy chow recipe! Just make the base recipe for the original chocolate and peanut butter flavor. To make mint puppy chow, you only need to add in one extra ingredient! What makes this recipe “mint kissed” is the Andes Creme de Menthe baking chips. I love love love andes mints (I’ve made some Andes Mint Fudge before too). I think the real reason I go to Olive Garden is for the chocolate mints they give you after dinner, rather than for the Italian food! I know I’m not the only mint chocolate addict here, so mint puppy chow just seemed like an obvious choice. These baking chips have such a nice creamy mint flavor that compliments the milk chocolate so well. It’s the perfect way to add in an extra kick to the recipe. And I think mint chocolate is such a great flavor for Christmas too. Something about that freshness just feels wintery and festive! Just like most of the recipes I make around here, this puppy chow recipe is super easy! 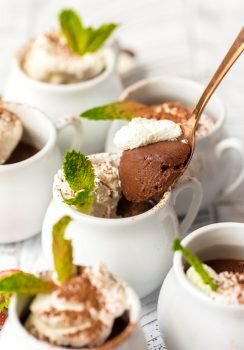 I love a simple snack that you can make in a pinch for parties (or just for those intense chocolate cravings that seem to come out of nowhere). Whether you make the original or the mint, this stuff will be ready to eat in no time! Start by placing the Crispix cereal in a bowl, and then set it aside. In a saucepan, melt the butter, chocolate chips, mint chips (if you’re making the mint version), and peanut butter over low heat until it’s completely melted and smooth. Pour the chocolate mixture over the cereal, and lightly stir until the cereal is evenly and completely coated. Place half the powdered sugar in a seal-able container. Add all of the chocolate covered cereal into the container, and then cover it with the rest of the powdered sugar. After coating in sugar, place the puppy chow on wax paper, and allow it to cool and dry completely. No baking, just shaking! Now that’s an easy party snack I can get behind. Make a bunch all at once and store it in an airtight container or resealable bag at room temperature. I love having this stuff around to snack on! And there you have it! When I was making these, I noticed my mom added a note to her 2001 recipe card: “For those of you who find yourselves addicted, there are PCA meetings (Puppy Chow Anonymous)” She didn’t want me to blog that part (sorry mom! ), but it’s so true. 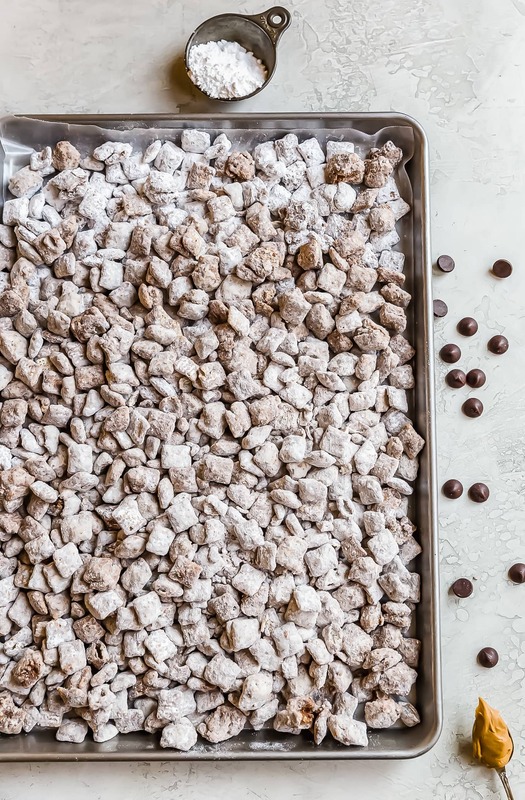 This puppy chow recipe is absolutely amazing and quite possibly addicting. Enjoy and eat responsibly! See the recipe card below for details on how to make Puppy Chow. Enjoy! 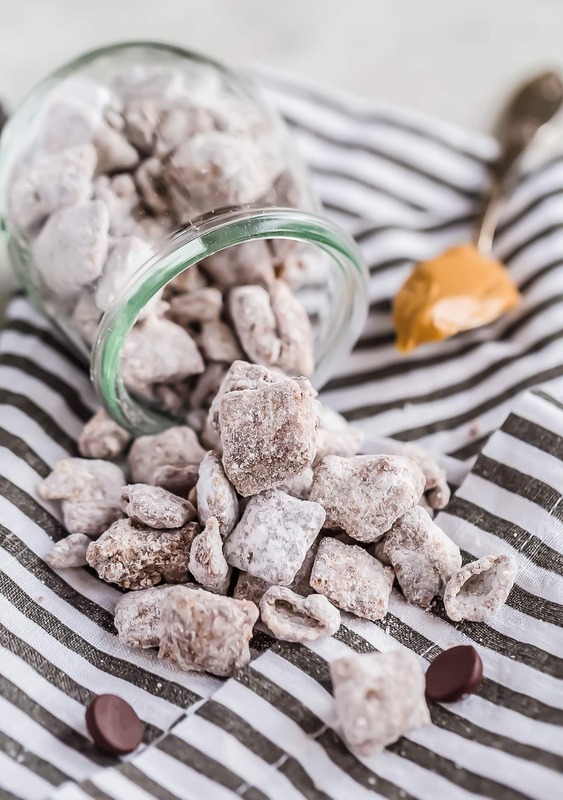 Puppy Chow is a chocolate-y treat that's sure to please! This easy puppy chow recipe includes an original version AND a mint chocolate puppy chow version. 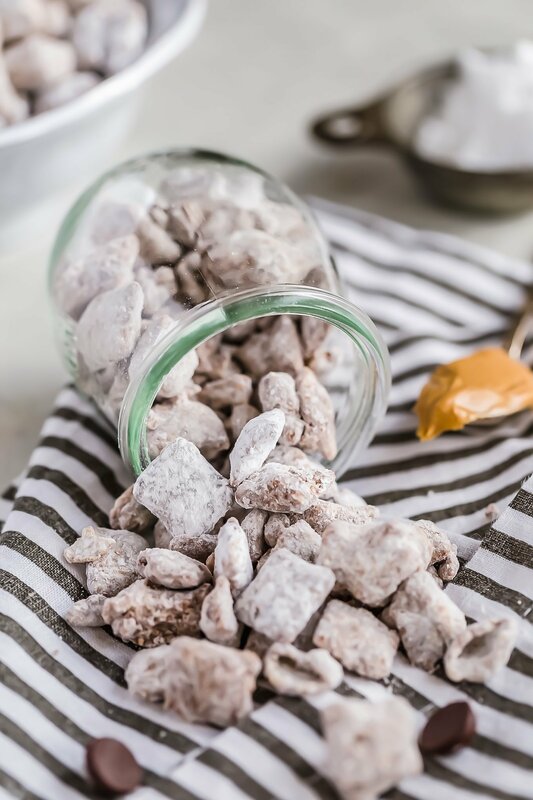 Find out how to make puppy chow for a simple yet delicious holiday treat! Melt chocolate, Andes Mint Chips, Peanut Butter and Butter over low heat. Pour the chocolate mixture over the cereal and stir gently until well coated. Place 1/2 of the powder sugar in a large plastic container which has a lid. Place all of the chocolate-coated cereal in the container. Cover with the other 1/2 half of the powdered sugar and seal tightly. Shake gently (upside up and down) until the cereal has been evenly coated with powdered sugar. Spread onto waxed paper to cool and dry completely. *Adjust the amount of powdered sugar to suit your own taste. This is the best puppy chow I’ve had. I’ve made this several times and it always a hit. Love to hear that! It’s one of my favorites too. Thanks for saying hi!! Good Morning Becky, Love your page in Taste of Home Magazine! Also Love your recipes. Thank you so much! Means a lot. Happy holidays!